Shouldn’t Have VVPAT Been Introduced by Now? VVPAT (Vote Verifiable Paper Audit Trail) is a process in which each vote polled in the EVMs is verified physically by the respective voters before leaving the polling booth. Thereafter, the paper audit trail of the votes polled is maintained by the EC. This procedure was directed to be implemented by the Supreme Court in 2014 in a PIL filed by Subramanian Swamy. The order has to be executed in a phased manner by 2019 elections. The EC has started testing it in sample polling booths, but of course it has not been implemented till now. I saw some TV anchors giving kudos to EC for carrying out spotless elections year-after-year. But they actually deserve criticism because they should have executed the Supreme Court directions by now. In fact, CAG or some auditor needs to audit the functioning of the EC. Furthermore, I don’t know how correctly the EVMs really function. If EVM is an electronic machine carrying a chip inside, it can be hacked at any stage of the elections, not only by actual infringement at the site but also remotely using wave technology. All intelligence agencies and also a few corporates have access to this technology, with which they can remotely hack EVMs, Computers, ATMs, and even Human Minds. This time a formal complaint has been lodged by Mayawati, the leader of BSP, with the EC, which seems to have been rejected in limine. Why? How is the EC so sure of its processes? What wrong will it cause to anybody if at least some sample machines from locations alleged to have discrepancies are sent for forensic examinations? Why is the EC so smug about its processes? In fact, these election results, esp. in UP, are indigestible. How is it possible that RLD has won only one seat when channel after channel showed Jat resentment with the BJP? How is it that voters in Muslim dominated areas voted for the BJP (as alleged by Mayawati)? Why is it that the PM of the country had to camp in Varanasi and even do a road show keeping his security at stake if the BJP was winning so comprehensively? Why Rajnath Singh needed to make a public admission that but for the SP-Congress alliance the BJP would have crossed 300 when it was anyways crossing 300? Why Rahul-Akhilesh road shows gathered much larger crowd than Modi’s did? What prompted senior editors to all of a sudden start issuing opinions in favor of the BJP when they have been filing completely contrary reports earlier? And why has EC rejected Mayawati’s allegation so abruptly and summarily? Well…there are too many unanswered questions. Some of these questions wouldn’t have arisen if the EC had executed the Supreme Court directions before the UP elections, which any institution of integrity would have tried its best to do. No, as a neutral observer, I am not giving kudos to the EC for anything! Only interested parties would praise them in a ritual after every election. I have no such obligation! Disclaimer: In my last post, I had said I won’t write on elections hereafter, but the contents of this post, I think, don’t concern elections per se. They rather raise an issue concerning the electoral rights of the people. 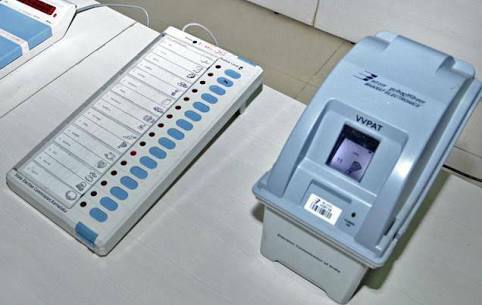 Be the first to comment on "Shouldn’t Have VVPAT Been Introduced by Now?"